Jordan Peele’s chilling followup to 2017’s Get Out had a phenomenal opening weekend at the box office, raking in $70.3 million over 3,741 theaters in the U.S. and Canada. Its exceptional performance this weekend makes Us the biggest opening of all time for an original horror film, and the third biggest for a horror film in general, behind only 2017’s It remake at $123.4 million and last year’s Halloween remake at $76.2 million, according to Box Office Mojo. It is also the biggest opening for a liv- action original film since James Cameron’s Avatar debuted at $77 million back in 2009. Us is the second directorial project from Peele, who has become one of the most in-demand filmmakers in Hollywood following his Academy Award-winning debut Get Out. 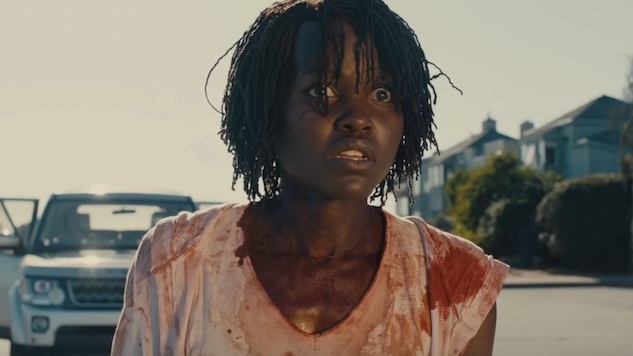 Us stars Lupita Nyong’o and Winston Duke as Adelaide and Gabe Wilson, who return to Adelaide’s beachfront childhood home for a vacation with their two children (Shahadi Wright Joseph and Evan Alex), only to be set upon by four masked attackers, each of whom turns out to be a doppelgänger for a member of the Wilson family. It also features performances from Elisabeth Moss, Tim Heidecker, Yahya Abdul-Mateen II, Anna Diop, Madison Curry, Cali Sheldon and Noelle Sheldon. Us opened in theaters on Friday, March 22, and has since made upwards of $87 million worldwide. It was produced by Peele’s Monkeypaw Productions, along with Jason Blum of Blumhouse Productions, and Sean McKittrick of Darko Entertainment and QC Entertainment. Peele also has a large slate of forthcoming projects in development right now, including a remake of the 1992 supernatural slasher film Candyman, which he is producing through Monkeypaw. He is also set to produce a forthcoming Amazon series called The Hunt about hunting Nazis in 1970s New York. Peele will also serve as executive producer and host of the forthcoming remake of The Twilight Zone, which will be available as a web series on CBS All Access. Check out the terrifying trailer for Us below. You can read our review of the film here.